Our world is changing faster than ever before. Keeping up with technology is much harder than keeping up with the Kardashians! How do you help prepare your children for the digital age, and a future that will look vastly different from our pasts? Let’s take this one step at a time! Below are six tips to help you and your children take some positive steps in the right direction and learn to navigate the waters of the digital age. Become a responsible digital citizen (and model that for your child). Let’s begin by defining digital citizen. DigitalCitizenship.net defines it as, “The norms of appropriate, responsible behavior with regard to technology use.” That’s a good starting place! What do you consider good and responsible online behavior for your children? Do you model that? We often tell students in the classroom that if you wouldn’t want your grandmother to read/see that, then don’t post it! Pause and Think Online is a great campaign from Common Sense Media aimed at just that idea. This video is an excellent way to introduce this idea to your kids. Digital Citizenship is a big topic and goes beyond the tips above. Take some time to explore the concept, what it means to you, and how to communicate about this with your children. Common Sense Media is loaded with resources and videos for parents, teachers, and students on the subject. Use this resource to help you learn and model good digital citizenship skills in your household. Click here to see all of the Digital Citizenship resources from Common Sense Media. YouTube is loaded with funny and interesting videos that keep you and your loved ones entertained for hours but did you know YouTube is also a powerful tool for learning? It is the first place kids go when they want to learn how to do something, and it should be a go-to resource for you to learn as well. Practice searching for tutorials for online tools and apps that your kids are using like Google Docs, Instagram, Blogger. Of course, it’s also great when you need to fix that dishwasher! Be sure to set up your YouTube profile and begin saving your favorite videos and tutorials to playlists so you can quickly find the videos later. Another great skill you can learn and share with your kids. BONUS: Create a how-to video with your child and upload it to YouTube! Start working on that positive online presence! Model a positive social media presence. Speaking of positive online presence, what types of thoughts and posts do you share online and across social media? Remember to model the behaviors you want to see from your children and stay positive. What happens in Vegas, now stays on YouTube, Twitter, Instagram and Facebook! Even after something has been deleted, it can always be re-shared and copied. Consider everything you post to be public and permanent, and model a positive online social media presence for your children. They will be Googled before they are accepted to college or hired for a job! Don’t be afraid to let your children teach you! Let’s face it, our students and children are pretty fast learners when it comes to technology. I say this to teachers all the time, but I think it’s a great tip for parents as well. Have your child show you how to use popular websites and the apps they use in school like Google Drive. They will love showing off their skills! The bottom line is to not only monitor what your kids do online but also to model positive online behaviors. Know what they are doing and who they are communicating with and ask questions! You might be surprised what you will learn from each other on your journey together as good digital citizens. With advances in technology and the changing landscape of ways to communicate, we must remember how important it is to stay connected in whatever age-appropriate way works best for your kids; especially to talk about tough issues like alcohol. 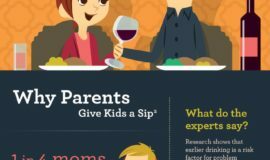 Parents are the leading influence on a kid’s decisions to not drink alcohol. The Foundation for Advancing Alcohol Responsibility (Responsibility.org) brings individuals, families, and communities together to guide a lifetime of conversations around alcohol responsibility. They have games and electronic resources through their Ask, Listen, Learn: Kids and Alcohol Don’t Mix program you can use to help with the tough conversations. Visit www.asklistenlearn.org/parents for tools and resources. Ask, Listen, Learn is also on Facebook, Instagram, Twitter and Pinterest! Kasey Bell is an award-winning digital learning consultant with a passion for technology and learning, and a member of our Educational Advisory Board.